We get a kick out of playing the word game Apples to Apples! We have lots of fun laughing at the combinations of nouns and adjectives that come up during the game. Anyone can play. So, our older teens can play with our 10 year old. (Not to mention Mom and Dad). If you like to play outrageously funny, you can just select the funny answers. If you want to be serious, you can do that too. But...you have to know whether the person deciding who "wins" that hand is a serious card selector or an hilarious card selector...you decide, then play your card. Hope your card gets picked! Great page!!! We love Apples to Apples, too! We like to play it at family holidays because it is a game that everyone likes, and lots can play. It is always a hit. You are right that it does help to know who will be picking the winner in that round, so that you can play to the judge. It really helps! I love all the games that you guys are posting in your site especially the money games. Did you know they have an apples to apples bible addition? I have a 4 yr old. So they are a little young for this game. But, I will get together at least once a month with some of my friends and family and play board games. I would say this is on all of our top list of favorites. The only problem I have with Apples to Apples is that it is pretty spendy. I have seen it anywhere from 20-40 dollars. But, you can get this at basically any store around Christmas time for $15. 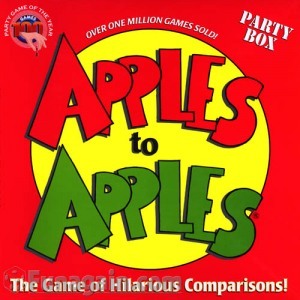 Very fun game...gets the family closer, they get to know each other, and the kids learn vocabulary at the same time. Some cards are not appropriate for younger kids...we just weed those out. We really like this game, too. Basically, there are green descriptive cards and red cards that are nouns. The judge for the round turns up and reads the green card, let's say it's "healthy". All the other players must choose a card (from their hand of red cards) which card best fits that word. Someone may choose "getting a hug" while someone else may choose "grapes". It all depends on what you have in your hand at the time. But it's always a good idea to think what the judge for that round might pick. All of the red cards are then given to the judge face down and he picks the one he feels best describes "healthy". Combinations are endless and hysterical at times! And now I just learned that there's a junior version for our little ones! We purchased this game a few years ago hoping that it would provide us with a few hours of entertainment and we were more than pleased with it! It's a great game for either small or large groups and works for all ages. We like bringing it out over the holidays and at birthdays, and many people have asked us where we bought it so they can purchase one for themselves.